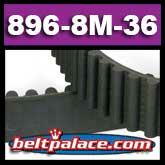 896-8M-36 HTD Drive Belt. Standard duty. 896mm Length x 36mm Width. 8mm Pitch. 112 Teeth. 896-8M-36 HTD Drive Belt. Replaces Standard Fun Cart Belt 1-20-0078. 896-8M-36 HTD Drive Belt. 896mm Length x 36mm Width. 8mm Pitch. 112 Teeth. Industrial power transmission belt used on indoor/street/boardwalk Go Karts and small engine equipment. Replaces: Standard Fun Cart Belt 1-20-0078. *CLEARANCE PRICED WHILE SUPPLIES LAST. 896-8M-36 Industrial HTS Drive Belt. 896mm Length x 36mm Width. 8mm Pitch. 112 Teeth. Industrial power transmission belt also used on indoor/street/boardwalk Go Karts and small engine equipment.